First, log in to Grow and press Add Metric. Go ahead and connect your data source, pull in some data, then press the blue Continue button. This will bring you to the Edit Metric screen for your new metric. First, change the chart type to Bullet Chart. Once you've done that, move over to the Bullet Data tab in the left-hand menu. 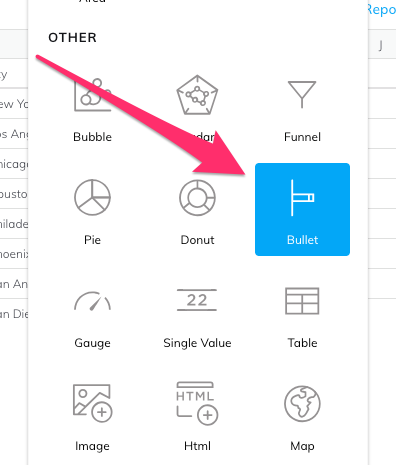 You will need to select 2 data points for a bullet chart, Value and Target. The value is where you are at, and the Target is where you want to be. Click Select a range and select the cell that holds your value. Next, click the blue Add data button under Target Value, then select the cell that holds your target value. If this isn't on your chart, you could always enter a value or equation in Spreadsheet Functions to represent it. The Bullet Chart includes an additional section under Performance Ranges. This lets you add shaded areas that show your benchmarks for low, medium, and high performance. 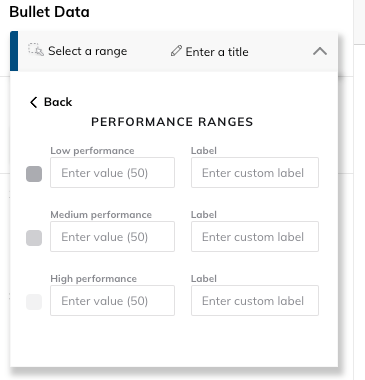 After selecting your data for your bullet chart, expand the section labeled Ranges under Performance Ranges. This section gives you three options: Low Performance, Medium Performance, and High Performance. Note: You will only need to enter a value, without the units that go along with it. For each category (low, medium, high), you can add your own custom labels.